Looking for the convenience of a serene ground level villa, but not willing to sacrifice an ocean view? Kolea 4D is one of the rare ground floor homes that fits the bill. Tucked in a most quiet and scenic location in the Kolea Beach Resort! This villa has been professionally furnished, while still conveying a comfortable, relaxing environment. The lanai doors slide within the pocket walls to unleash the delightful breeze and sounds of the ocean throughout the home. A well manicured garden is your personal yard, just beyond your barbecue grill and summer kitchen. 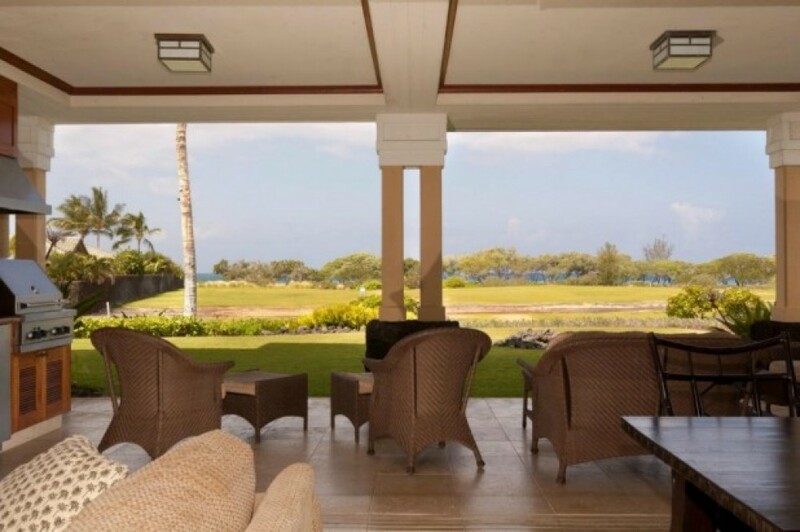 The oceanfront lot is a continuation of a lush green lawn which means unobstructed ocean views, even as you stand within the villa. There are three bedrooms and three baths. The master bedroom is appointed with a king bed. The master bathroom has an enclosed walk in shower complete with a travertine bench. A deep soaking roman tub is romantically situated within mahogany louvered bi-fold windows creating a lovely retreat to retire to. Dual vanities set in stone, the large walk in closet and private lanai provide the golden touches to this room. The guest suite has a full size bed and a private bathroom with a walk in shower. This shower also is outfitted with a travertine corner bench. The third bedroom is furnished with convertible twin beds, which also serves as a daybed. This room has a door opening out to the lanai, as well as it’s own door to the central bath with a tub/shower. The gourmet kitchen has a multi level granite island, ideal for entertaining while preparing meals. Three barstools provide seating at the island for family or friends. Pendant lighting drops down from the ceiling to illuminate this area. The kitchen has built in stainless steel appliances, including a retractable downdraft. The kitchen is stocked with wares and the dining table seats eight. A cozy couch and loveseat invite you to relax, while enjoying a large flat screen television in the living room. A full size washer, dryer and sink are available in the laundry room. Kolea guests enjoy the use of the Kolea Beach Club which has a pool, spa, exercise hale and keiki pond complete with a waterfall and sandy bottom. Kolea is the only resort in Waikoloa which has direct beach access to grand Anaeho'omalu Bay. A short walk to this sandy beach and you will find activities such as snorkeling, glass bottom boat tours, paddle boarding and whale watch cruises. The Waikoloa Beach Marriott is immediately south of Kolea and the Hilton Waikoloa Village is north of Kolea. Both hotels offer dining, spa treatments and luaus. The Hilton is also home to Dolphin Quest. $ SECURITY DEPOSIT:	$500 REFUNDABLE DEPOSIT REQUIRED TO SECURE YOUR RESERVATION. DEPOSIT IS REFUNDED 10 DAYS AFTER YOUR DEPARTURE PROVIDED EXCESSIVE CLEANING NOT REQUIRED, NOR ANY OCCURRENCE OF PROPERTY DAMAGE. DEPOSIT WILL BE LOST IF RESERVATION IS CANCELLED PRIOR TO RENT COLLECTION. $ CANCELLATIONS:	DEPOSIT IS LOST OF RESERVATION IS CANCELLED PRIOR TO RENT COLLECTION. RENT IS LOST IF RESERVATION IS CANCELLED AFTER COLLECTION. RENT WILL BE REFUNDED IF VILLA IS ABLE TO BE REBOOKED FOR SAME DATES. CURRENT SPECIAL:	7TH NIGHT FREE HOUSEKEEPING:	DEPARTURE HOUSEKEEPING FEE $225 RENT:	FULL RENT INCLUDING TAXES AND HOUSEKEEPING FEES WILL BE COLLECTED 60 DAYS PRIOR TO YOUR ARRIVAL DATE.